Our longtime friend and inspiring genius of our galaxy, that badass himself (more accurately known far and wide as the Bad Astronomer) Mr Phil Plait has a brand-spanking new video series just released in conjunction with PBS. And I can not recommend it more. It’s called, Crash Course in Astronomy. The set is lovely, the lighting is divine and Phil’s orange shirt beautifully compliments the blue wall. But if that isn’t enough to draw in your attention know that you might just learn more about astronomy in 12 minutes than you have in your entire freaking life. And this is just episode one. 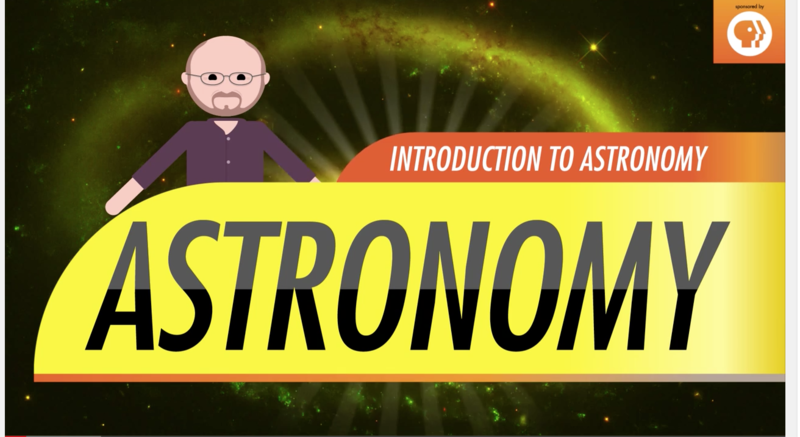 Crash Course in Astronomy is an awesome rapid-fire information blast about one of the sciences that I find the most inspirational and exciting. And best of all it’s delivered like delicious piping hot pizza to your brain by one of my all-time favorite people. This episode answers the questions, “what is astronomy?” and, “who exactly are astronomers these days?” while taking you on a whirlwind tour of time and space. So what are you even waiting for? Go watch it now and feel your heart and mind swell with the glory of the tasty cosmos! It’s an all you can eat buffet of astronomy and science facts just waiting for you to double dip into. Thanks for posting this. I love astronomy and I love Phil Plait. I think I’m going to enjoy this new series.